For Chinese New Year this year, we were lucky to have our family member from overseas in town for it. 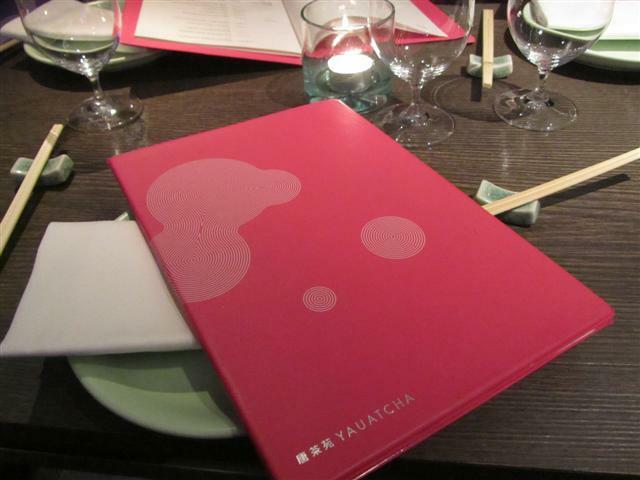 To make it an extra special celebration, we went to Alan Yau’s Michelin-starred Yauatcha restaurant in Soho. 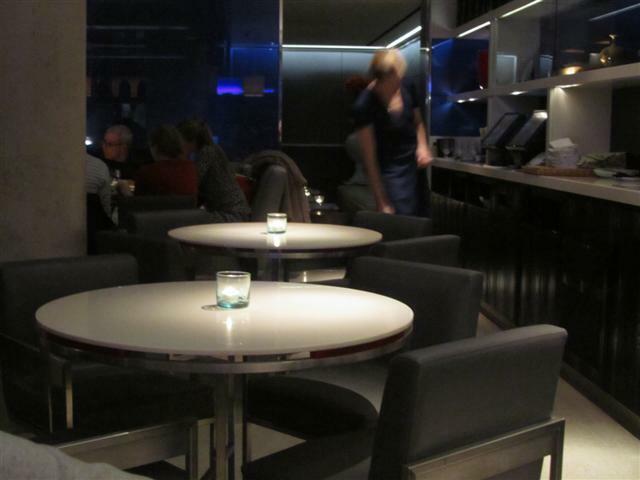 This finally fulfilled yet another one of my dreams and that was to go and dine at a Michelin-starred restaurant. 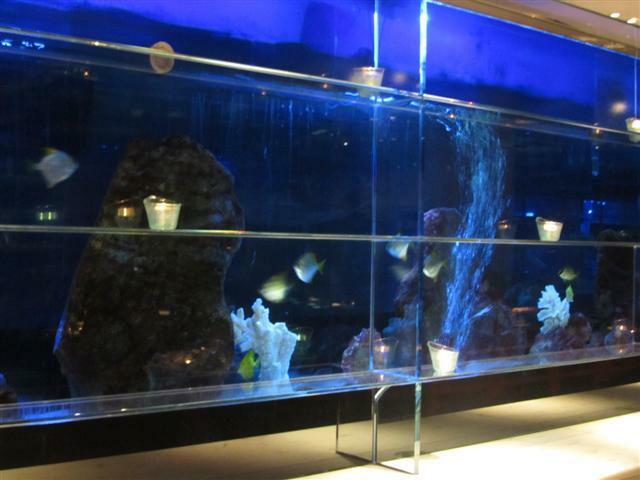 Yauatcha has a blue theme with a wonderful fish tank along one wall of the restaurant. Just inside the entrance is the counter fridge displaying the many eye catching desserts. The soft lighting sets the mood of the restaurant. There is some cushioned seating and also some round white tables and dark leather chairs. Two floors make up the dining area with the lower level having a livelier vibe. There are little alcoves decorated with tea lights and a panelled low level beige and dark wood ceiling. The waitress was really friendly and so welcoming. She made our time at Yauatcha feel very personal and special. We were instantly put at ease and made to feel comfortable. All throughout the meal, she made sure that everything was okay. The menu was explained thoroughly and we learnt a lot about the many different teas that Yauatcha serves, from the normal black teas right through to the blue teas. 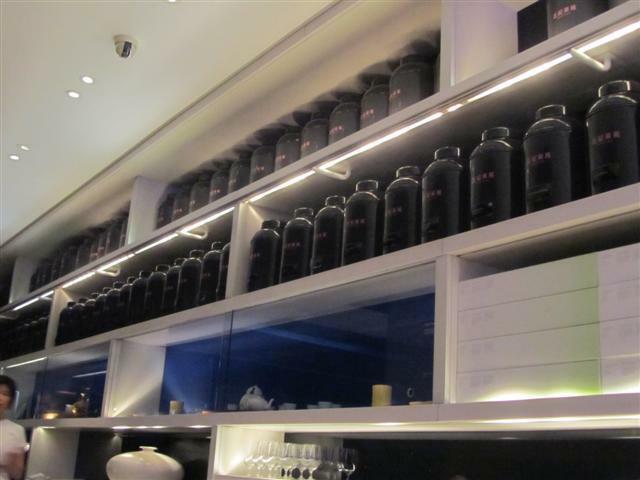 About the teas, the big dark tea caddies lined the shelves along the back wall of the restaurant. The tea was served by the pot. Instead of the tea this time though, I was taken by the Hakkasan Virgin cocktail. 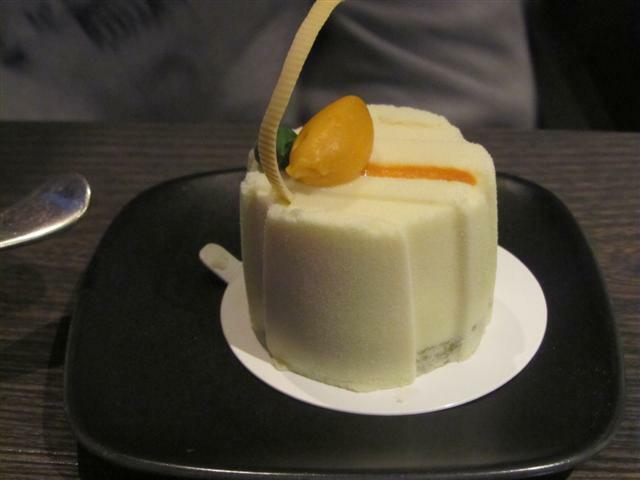 This is a speciality of Hakkasan restaurants, which Yauatcha is a part of. This sweet cocktail was truly amazing. 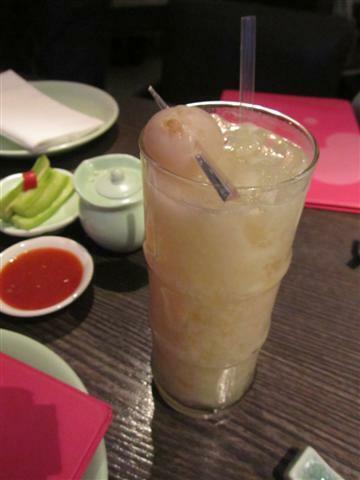 It was a combination of lychee, passion fruit and coconut. If you like Pina Colada, then the Hakkasan Virgin cocktail could be your new favourite drink. It has the right amount of coconut so that it is not a heavy drink. Yauatcha does food of a high quality and all of the dishes were presented beautifully. The portion sizes were big, which took us by surprise, as we were expecting them to be quite small. After we had finished our starters, we were given clean fresh plates for us to have our main meal. All through the meal, the staff cleared up the crumbs from the table and made sure that our table remained clean and clutter free. So, now onto the food. We had a pretty fantastic selection of starters and mains and made sure that we had some room left for the desserts. Two lotus leaf parcels were filled with sticky rice, tasty chicken and dried shrimp. 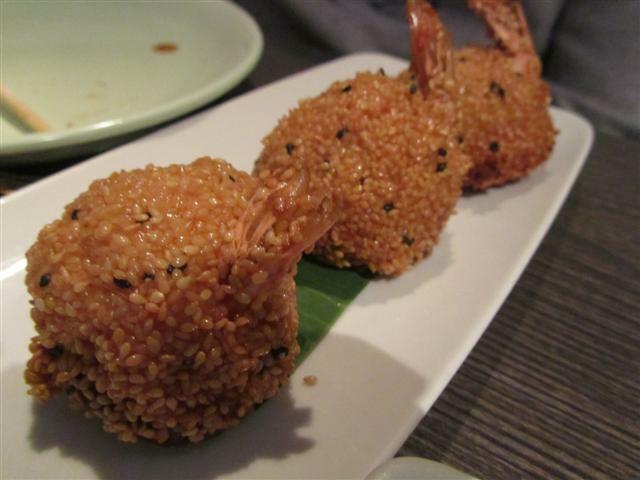 The prawn toast were three round balls packed full of juicy prawn and coated with sesame seeds. 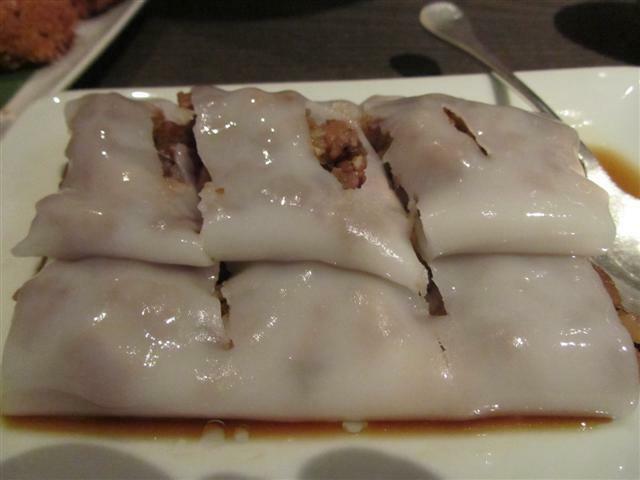 The char sui cheung fun had a delicious barbecued pork filling. The outer white coating was not too thin or too sticky. 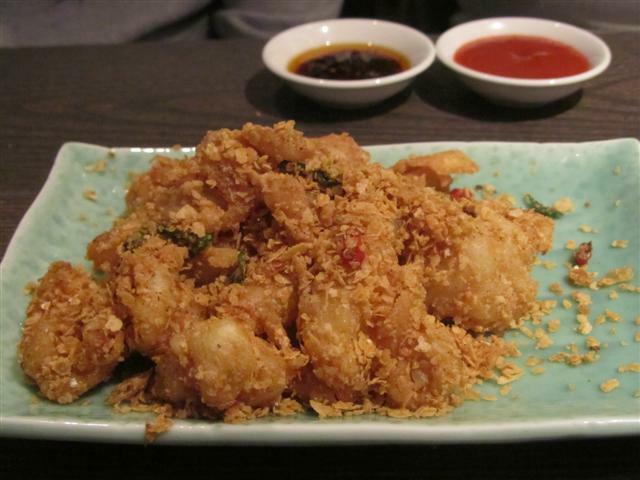 The chilli squid was coated with oatmeal and curry leaf. This sounded like an odd combination, especially with the crumbly oatmeal, but the flavours definitely worked. The squid was really soft and moist. As for the meat dishes, none of them disappointed. 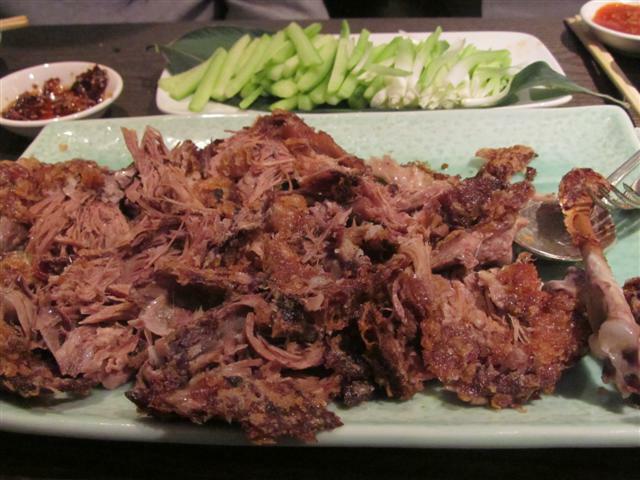 The classic crispy aromatic duck was a plate of tender shredded duck. The meat was not at all fatty and it had a great crispy skin. Small thin warm pancakes, together with cucumber matchsticks, strips of spring onion and finally the plum sauce were perfect for the duck wraps. 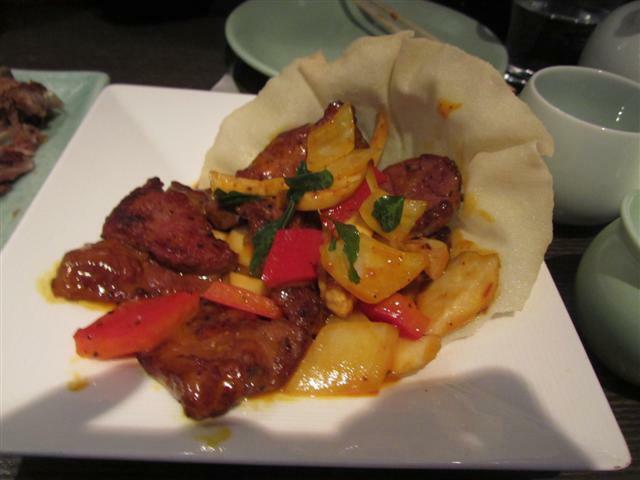 Another great meat choice was the sweet and sour Berkshire pork. 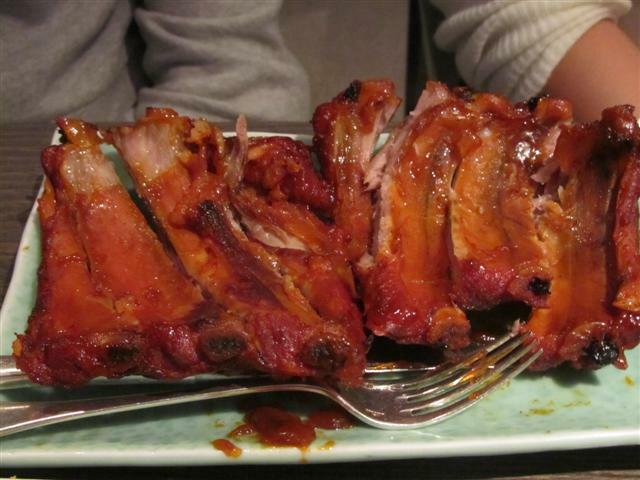 These ribs were coated in a sweetish sauce and again the meat was cooked so well, that it just fell off the bone. That all made up our first round of food! An interesting main dish was the Mongolian style venison. This was in a butter and black pepper sauce. This was the first time that I had ever had venison. I was expecting it to be a really heavy dense chewy meat, but this definitely wasn’t the case. The chunks of venison were melt in the mouth and it was beautifully cooked. It reminded me a bit of lamb. The venison dish also had big slices of peppers and onions. There was a vegetable in this dish that we really could not tell what it was. It was slightly spongy like aubergine but also was a bit like courgette. As we couldn’t identify it, we asked our waitress what it was. She solved our mystery by telling us that it was the trumpet mushroom and also gave us some information on it. 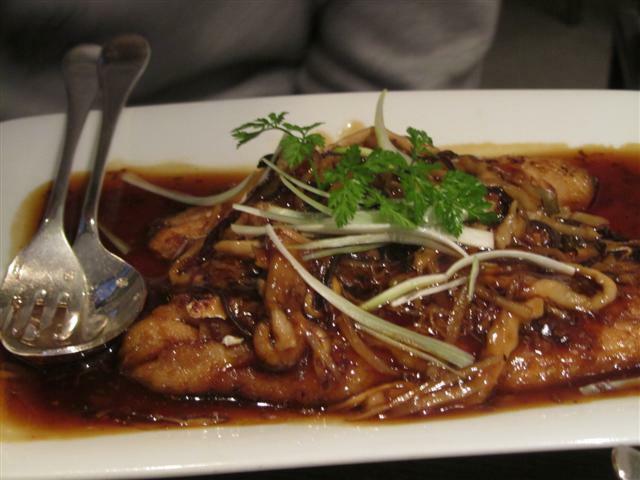 The traditional style fried sea bass were two fillets of fish. These were with an osmanthus sauce. The fish had a light delicate flavour. 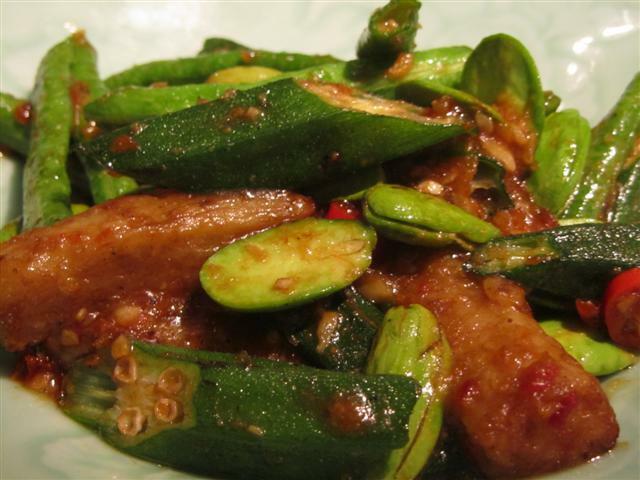 Our vegetable dish of spicy aubergine, sato bean, okra and french bean was wonderful. The skinless aubergine chunks still had some firmness to them. The vegetables were not at all over cooked. Lastly, we had a stir fried udon noodle dish. 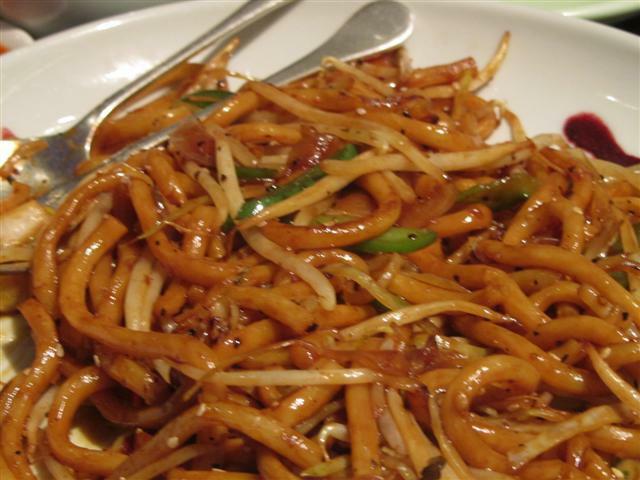 The noodles were coated in a black pepper sauce and had strips of vegetables running through it. We were surprised that we didn’t need any rice to go with our main meal. This was a good choice as it meant that we truly got to appreciate all the flavours and textures of the cuisine. The desserts all looked so tempting and we were spoilt for choice. Luckily, there were a few of us dining, so we got to have a selection and sample the different delights. As it was another special occasion, a slightly late birthday celebration, one of the desserts was presented differently for the birthday girl. The rose flower shaped raspberry delice was presented on a slate, with a scoop of ice cream, fresh raspberries and wafer thin chocolate. The raspberry delice had a soft chocolate centre, raspberry sauce, biscuit and had a red powder like coating. 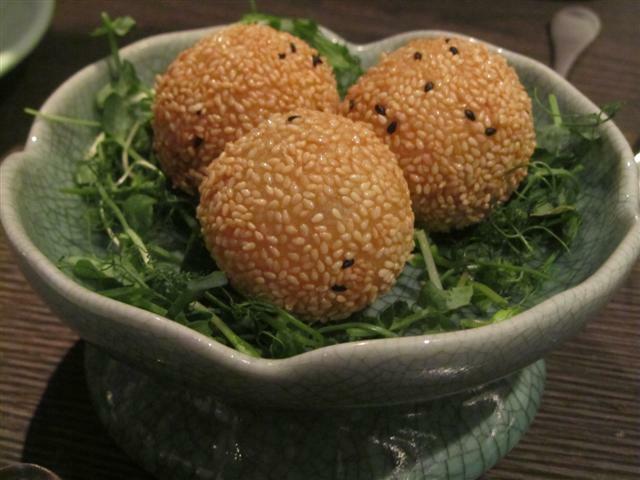 Three big sesame seed balls were served warm. They had a crispy outer and the inner had an oozing black sesame seed centre. It was actually quite a nice dessert. 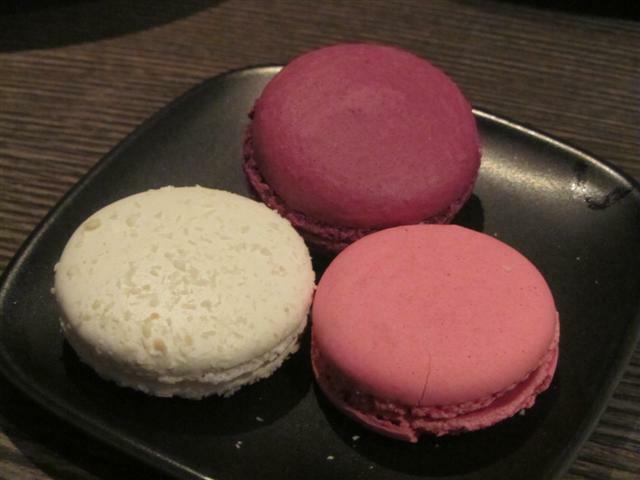 A dark plate contained the colourful macaroons. The selection that we had were cherry, coconut and strawberry. They had the crunchy outer and a chewy softer inside, just like they should be. Saving the best till last, was my favourite of coconut charlotte. This was a combination of white chocolate, coconut, mint and basil. There was a thin layer of mango puree running through this dessert. Yauatcha definitely gets my vote! It is an amazing place and the food was absolutely wonderful. 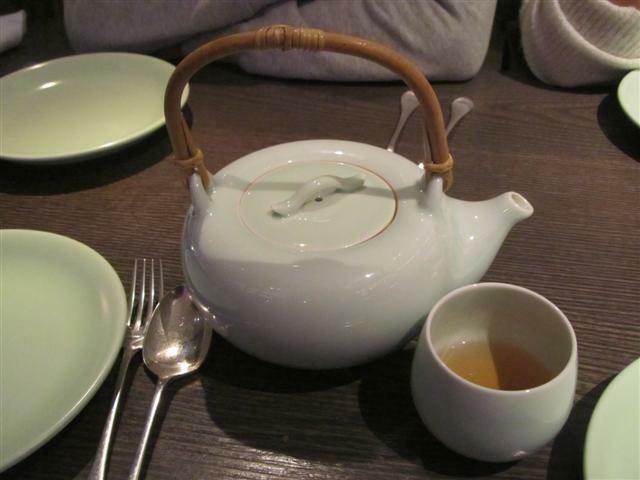 Dining at Yauatcha, we got to sample new tastes and items. All of which impressed me thoroughly. 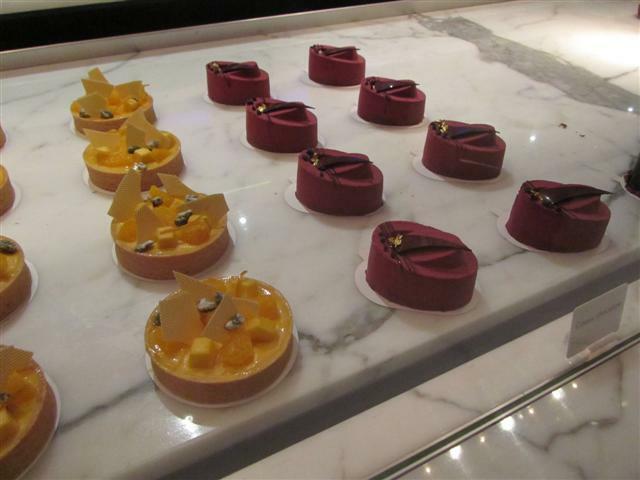 As you can see, I’m definitely a big fan of Yauatcha and I’m sure you won’t be disappointed! 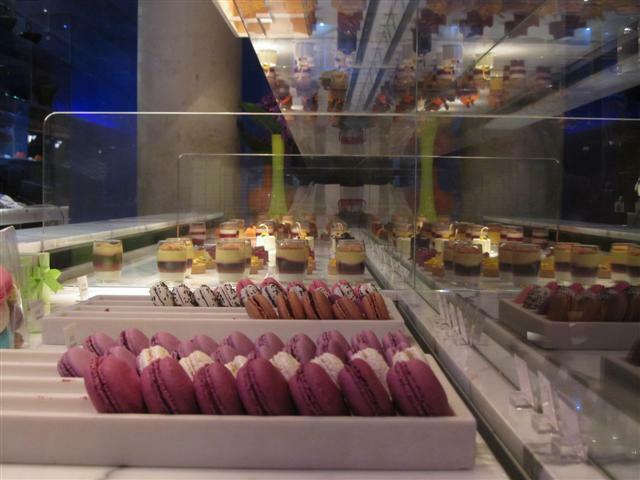 The desserts are truly delicious, and it’s hard to choose between them! Something to note, is that they also do takeaway orders for the desserts. Enjoy! Looking forward to hearing how your visit goes! 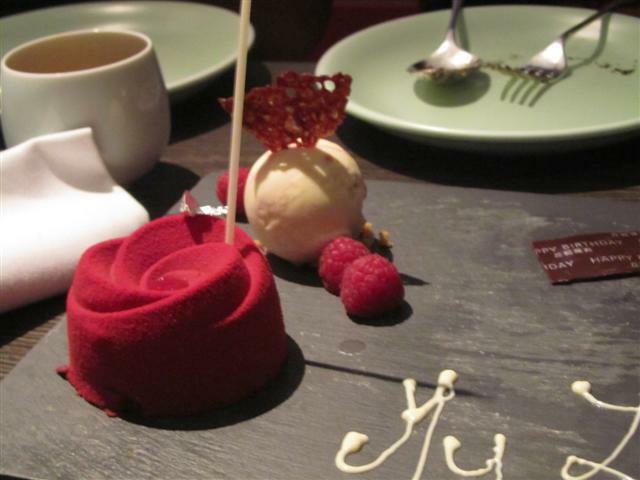 I have still not been to Yauatcha, reading your review I think it’s about time! Sounds and looks delicious, chocolate, mint and basil, to die for!